The film will be accompanied by Minima, live in the cinema auditorium; the band are making their second visit to the Picture House, following a well-received performance of Phantom of the Opera in June. Formed in 2006, Minima's music is an audacious 21st-Century interpretation of the images of silent and avant-garde film, and their repertoire includes scores to surrealist films, horror and science fiction. Minima's Alex Hogg said, “Films from the 1920s have a different pace, and for the uninitiated it can be hard work so a contemporary interpretation by musicians can really help. You can make people laugh, cry and jump out of their seats but we only do this in the name of accompanying the film and helping people to watch. Our eclectic range of personal influences, gives us what we consider a unique take on silent film accompaniment. We can go from drum ‘n’ bass to tango, and from wall-of-sound to folk lament in the space of a few minutes. Nosferatu is a great piece of cinema - it is a real crowd-pleaser!" 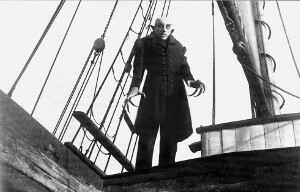 Nosferatu (PG) is showing on Saturday 8 November at 8pm. Tickets cost £11 (£10 concessions) and can be booked in advance through the cinema's website, www.wottoncinema.com. Advance tickets can also be purchased at the cinema during opening hours, or by calling 01453 844601.